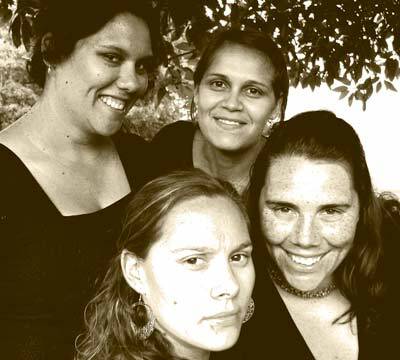 Band members: Sisters Lucy Simpson (vocals, Yuwaalaraay nation), Nardi Simpson (vocals and guitar, Yuwaalaraay nation with ties to Gamilaraay country), Jilda Simpson (vocals, Yuwaalaraay nation) and best friend Kaleena Briggs (vocals, Yorta Yorta / Wiradjuri nation). The Freshwater girls sing their songs in all four languages. Freshwater was formed in 2005.